Here is a great “cheater” recipe. By cheater, I mean I did very little prep. Sometimes I just don’t feel like peeling a ton of carrots and chopping them into carrot sticks. In a bowl, mix carrots, salt, herbs/spices and whey. Stuff into a mason jar, leaving about 1″ head space. Fill jar with filtered water, cover and give it a shake to mix everything up. Make sure everything is submerged under water. Sometimes I’ll place a a small jar top that will fit inside the mason jar to keep the veggies under. Set in a warm place for 5-7 days. Warm place, eh? Not so easy here in the frozen tundra. Our house gets cold in the winter. I’m a cheapskate and I hate spending tons of money to keep my house at 72F so I don’t. It’s closer to 65F here. We wear sweaters. The radiator in my kitchen doesn’t work well so that room can get quite nippy when it’s -40F outside. I once left a bowl of water on the floor and woke to found it frozen. Eek! Luckily the pipes are on the inside walls so they are safe. So how does one ferment when it’s so cold. My counter top yogurts (piima, viili and kefir) don’t set when it’s that cold, even when placed on top of my refrigerator. So I need to get creative. One day when I was going through baby stuff, I found a wipes warmer. Never used, still in the box. I’ve always thought those things were worthless. Boy was I wrong! It works great as an incubator for my lovely cultures. With the top open, it keeps whatever I place inside it around 80F. Right now I have two jars of apple cider, one grape juice and one kefir all fermenting away. It’s on my list of most useless parenting tools 🙂 It’s a wipes warmer. You put baby wipes in it and it keeps them warm so you don’t shock the kid with a cold wet wipe during a diaper change. I guess I’m just mean since I warm it up in my hands instead. It does keep ferments a the right temp in my cold house though. What is your opinion on fermenting in ball jars vs pickl-it jars? I actually don’t use or recommend ball jars period anymore. Using an anaerobic jar like a Pickl-it is by far the best way to go. The ferments almost always turn out great with no mold issues. Just came across yr site today while I was looking for info about troubleshooting pickled goods. So I hope you might help me! I followed a recipe for dilly carrots – not exactly the same as yours, but pretty close. The recipe said to leave 4-7 days, and I left them 7 days and today opened them to taste. They’re ok, but mainly really salty, I don’t detect much sourness. Is this how they’re meant to taste? I’ve had them in the fridge all day, but if they’re not properly fermented, can I put them back in the bench to keep fermenting if they weren’t ready? I’m sorry, I did a revision of this recipe and thought I had linked to it in this recipe (I revised most of my older recipes since I learned a better method). I now use anaerobic jars that are airtight with an airlock and one of the benefits of those jars is you can use less salt. I use a 2% brine (4 tsp fine sea salt per quart of water) and pour that brine over the carrots, no whey is needed. 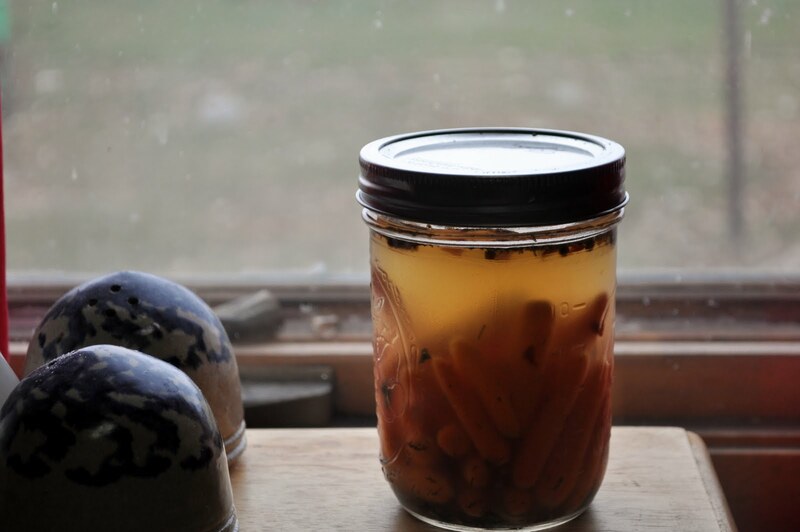 Carrots do seem to need a little more time in the refrigerator to ferment. After a week they still taste pretty fresh but after 2-3 weeks (one week on the counter, 1-2 weeks in the fridge), they’ll taste more pickle like. They will also taste less salty over time as well.